"Quick, healthy dinner. I made the vinaigrette the previous day using red wine vinegar, olive oil, and Dijon mustard." Heat a nonstick skillet over medium heat, and cook chicken thighs until barely pink in the center, about 20 minutes, turning once; stir in onion and garlic, and cook and stir until onions are translucent, about 5 minutes. 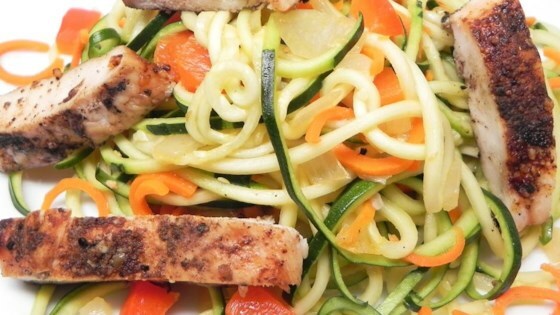 Stir zucchini, carrots, and bell pepper into chicken mixture; cook and stir until vegetables are tender with a bite at the center and chicken is no longer pink at the center, about 5 minutes. An instant read thermometer inserted into the center of chicken thighs should read at least 165 degrees F (74 degrees C). Stir vinaigrette into chicken mixture; cook until heated through, about 2 minutes. Delicious! I didn't change anything, and my husband and sister voted this as a "keeper"!! This came out a little soupy. I'm not sure why. I used boneless chicken breasts in place of thighs because that's what I had thawed. The completed dish was delicious and I will make it again. I used snap peas, spiral cut zucchini, and Marzetti's lemon vinaigrette. Excellent! !